Willow Wednesdays: Behind The Scenes! It’s Monkey Queen anniversary week! We’ll be celebrating all week with a look behind the scenes at all four Monkey Queen novels and much more, and we’re up to the second, The Brigadoon Boondoggle! The basic plot for this was inspired by some long-ago ideas I had for a science fiction comic with political overtones. The two sides competing over the meadow were a more rat/mouse like species and an avian species, both of which figured in the sci-fi comic, but after a draft I changed one, then the other. The bawsons were originally more like badgers than raccoons, but I changed them for a reason I’ll explain when Redblade comes out. Musgrove was originally intended to have a partner called Hess, as a tribute to two characters in an older unpublished work, but I realized it was excess baggage. I did find a use for the name, and HESS does actually stand for something. Someday, I’ll figure out what that is. And the fight scene with the Jakes was largely taken from another comic script I had written back in the day, as a one-shot introductory special. I still love Little Jake’s “Oh, I think I’ll just lie here until the pain subsides” line. Favorite Reference: Beth’s reading material during her recovery includes the latest Maggie MacKay book. Maggie’s adventures are written by one of my favorite writers and inspirations, Kate Danley. Go read them! Most Obscure Reference: Miraculous Ladybug. It won’t be when the show actually premieres in October (December in the US), but for now it counts. But I’m still glad I did it; if there was ever a TV show that would inspire Michiko to Beth-like levels of geekdom, this will be it. Did you know: The short story “Three Women In A Stew (To Say Nothing Of The Guinea Pig)” takes place between the last two scenes of The Brigadoon Boondoggle? You can read it here, or click the “short story” tag to read all the Monkey Queen short stories to date! The Summer Sale continues! Get The Brigadoon Boondoggle for 99 cents US! “Maybe so,” Michiko said, barely keeping her emotions in check. “But this isn’t a game. This isn’t something you can decide by flipping a coin. Maybe you see it differently, but all I see are refugees who are scared because they may lose their new home and a lonely girl who can’t even afford warm clothes. And I have to help them, all of them. It’s why I do this.” She turned and walked away. The countdown is on! Get the second Monkey Queen book, The Brigadoon Boondoggle, for just 99 cents at Amazon.com! This sale will run for exactly one week and will end at 11:59 PM PST on July 22. It’s limited to Amazon.com, but by the end of the day we’ll have a sale going in all the Amazon stores. Don’t forget to look for this awesome cover by Willow! Michiko, the hero known as the Monkey Queen, and geek girl Beth McGill thought it would be easy. They’ve become good friends since they started working together to save the world, why not become roommates? Of course, that was before the kitchen fire. And the broken bedroom door. Not to mention the cranky guinea pig. But they have bigger problems ahead. A shady real estate deal has left two new groups of Emigres arguing over a meadow. Other Emigres are vanishing without a trace. And enemies old and new lurk in the woods, in the shadows, even in dreams. 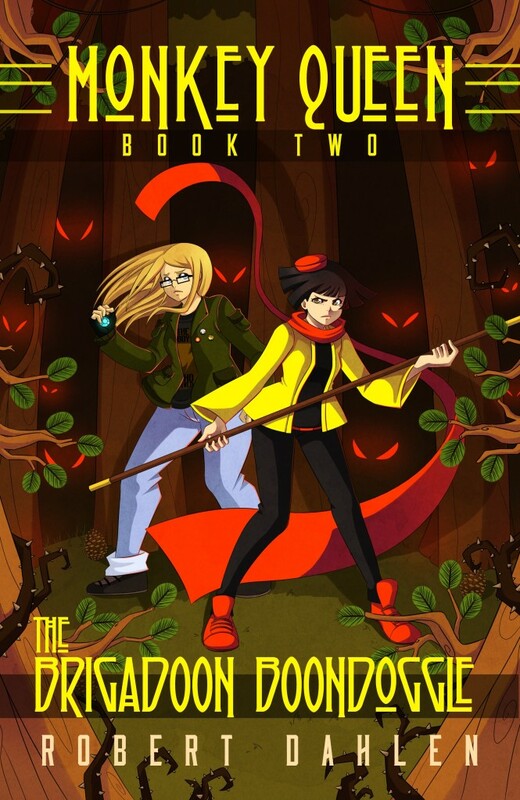 Can Michiko and Beth stop the darkness that lies ahead…or will they be the next victims?